After installing VMWare 2.0 and VirtualBox 2.0.2 i wanted to make a comparison of both virtualization engines. I thought about installing the same guest in both software stacks. But this seemed like too much work ;-). 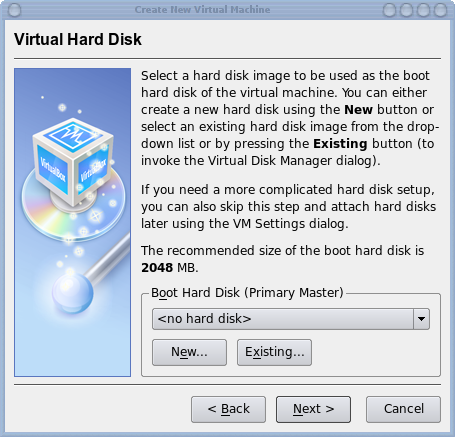 So i started to google about migrating a guest from VMWare to Virtualbox. I found this helpful blog. 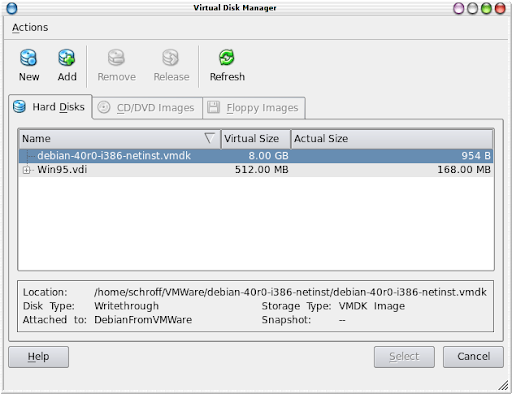 and added the vmdk-file from the debian-guest, which i used with VMWare Server 2.0.
and i changed in /etc/fstab all entries with sda to hda. After these changes, the guest bootet without a problem in my VirtualBox. But it is clear, that with this configuration, it will not run on VMWare. So i changed in the .vmx file all entries form scsi0:0 to ide0:0 and in the .vmdk file the parameter adapterType=lsilogic to ide. Now the guest os is able to start in both virtualization servers. If you to know how to configure networking via GUI, read this posting. Since I don't have the VMware, I can't do the changes you stated in your guide, using vmware. I just got the vbox and the guest image created in vmware. I tried to change the booting parameter from sda2 to hda2 exactly in the grub -not in menu.lst file-, as you can predict, since I don't change the /etc/fstab, I received kernel-panic error. So, do you know any other solution, using only the vbox? For those stumbling on this thread as I did, it may be good to try just changing the root device in grub. My VirtualBox (2.1.4) also hung trying to find the root disk, but after changing to root=hda1 my image (debian lenny) booted just fine. Even if the disk is referenced (and eventually mounted) as /dev/sda1 in /etc/fstab. I also believe that newer Ubuntu's use a UUID to identify disk and don't rely on the old /dev/(s|h)dax notation. So changing the root device in grub should be enough there too. I have a vmware virtual machine with ubuntu 8.10. I tried to run it in virtual box. It first worked fine but at second but it went into read only mode for the mounts and stopped working. Also whenever I tried to start the same virtual machine in vmware grub returned the error message 18. I figured out that I had to change the setting in the vmx and vmdk file to start in vmware now. Also i figured out that the harddisk was corrupt had to start from live disc and repaired the volume. Also I had to recover the fstab file which got lost. Now my virtual machine works in vmware again, but when I change the vmdk and vmx fiel back to scsi grub gives me the error again. What can I do? in the menu.lst all possible booting options are linked via the uuid and changing it to /dev/sda1 does not help either. What does virtual box change in the linux confguration? Thank you very much! you saved me a lot of time! get a person's attention? I mean "Using VMWare Images with Virtualbox" is kinda vanilla. You might peek at Yahoo's home page and note how they create post headlines to grab people to click.